A bank robbery in Takoma Park, Md., came to a dramatic and violent end Friday when the suspect emerged from the bank with a hostage, slipped on some ice and was gunned down by police. The suspect was killed and a police officer's leg was grazed by a bullet, according to Takoma Park Police Chief Ron Ricucci. Two other civilians were injured at the scene, but not shot. The incident started about 9:25 a.m., when police were called to the Capital One bank for a reported robbery in progress said Ricucci. In a video obtained by ABC News, the bank robbery suspect is seen emerging with a woman, apparently a hostage held at gunpoint. 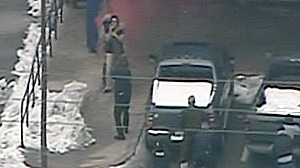 As the suspect attempts to edge away from police, six of whom are standing just feet away, a packet of explosive dye the bank had put in with the money goes off. Caught off guard, the suspect appears to slip on a patch of ice. The suspect loses his grip on the hostage, allowing her to break free. As he tries to chase her down, three officers from Takoma Park and three officers from Prince George's County open fire on the suspect. The man was taken to a trauma center where he later died. Six people were in the bank at the time of the robbery. They had all emerged from the bank by the time he came out with the last hostage. One customer had been pistol-whipped; another was said to be in shock. The hostage is currently being treated at Prince George's County Hospital. "Obviously, she's shook up, but she's fine," said Ricucci.